In 1974 Hungarian Erno Rubik invented what would become the world’s biggest puzzle seller in history. It took him 6 years to market the puzzle. By mid 1981 – the craze became a worldwide phenomenon. Go to the 4 corners of the world today – almost everybody has played with it. 35 years later, Rubik’s Cube not only keeps on selling, it’s enjoyed a new burst of enthusiasm – thanks to the internet. 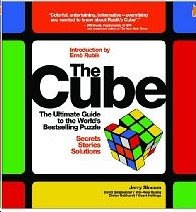 David Singmaster, a contributing author, covers the history of the cube. Here we learn about Larry Nichols, a Harvard grad student who invented a 2x2x2 cube with magnets in 1959. With his patent, he sued CBS (which previously bought the Ideal Toy company, which licensed the Rubik’s Cube) for $60,000,000. The star witness was none other than Jerry Slocum! Nichols won the case but lost on appeal. Mr. Singmaster, a mathematician, helped fuel the cube craze with his own solving notes which he published. He also started the speed solving competitions. 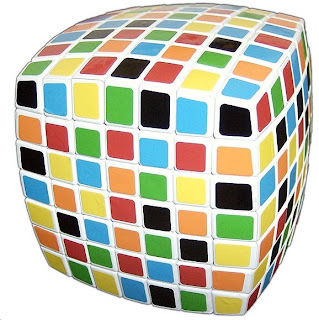 One distinct memory: My wife recognized the cube as an enemy as soon as I showed it to her. Geert Hellings writes about variations of the cube. This is where things get exciting. The obvious variations 2x2, 4x4 & 5x5 were quickly invented and produced. Rubik holds the patent for the 2x2, while Peter Sebesteny and Udo Krell own the patents for the others, respectively. It was considered impossible to construct a 6x6 cube. Fortunately Panagiotis Verdes was not aware of that. He recently invented and produced the 6x6 and 7x7 cubes. He has designs for cubes up to 11x11. Mr Hellings then takes us into the world of Twistypuzzles.com where aficionados have decided that the world needs more polyhedral rotational sequential movement puzzles. The shapes, colors and complexity are dazzling, inspiring and are cumulatively a celebration of human ingenuity. Some of these puzzles have been mass produced – the Pyraminx sold over 90,000,000. The Megaminx sold less, but is still available at mefferts.com. 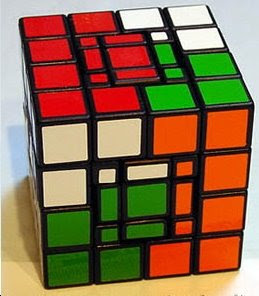 Other inventors have produced strange hybrid puzzles in very small quantities that often sell for thousands of dollars. Tony Fisher’s Overlapping Cube is a combination 3x3, 4x4 & 5x5. Anthony Greenhill’s Dodecahedron combines elements form Square-One, which is one of the hardest puzzles. Then there’s Andrew Cormier who made the Teraminx with 542 outer pieces. The final chapter consists of very clear instructions for solving all ‘normal’ cubes from 3x3 through 7x7. To the authors, we say Bravo!